Everybody updates status on Facebook and Twitter. But not everybody can grab the attention they want. Today I want to show you an easy way to make your status catchy, and make people read it. Not just with status, the upside down text works in comments too. 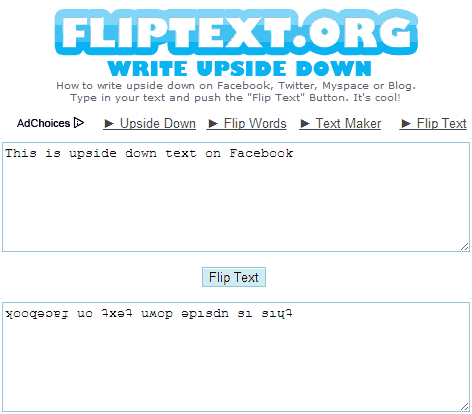 The upside down text can be used on social networking sites like Facebook, Twitter, and all the others too. There are many web applications to do that. Two of the best ones are Flip Text and Upside Down Text. You need to type or paste the text into the first box, and the other box will give you the upside down text side by side. Then copy the inverted text and post it on Facebook, Twitter or any other social media website. That’s it. Now, update flipped statuses on Facebook and shock your friends.